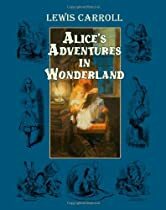 Reasons for Reading: I read/listened to Lewis Carroll’s Alice’s Adventures in Wonderland back in 2010 but didn’t review it. Carroll’s classic was part of my Revisited Challenge and it received the most votes. Thus, I picked up an audio version for the second time. Summary: Young, precocious Alice finds herself quite bored while sitting on the banks of the River Isis with her older sister. However, the talking, clothed, and tardy White Rabbit runs past and catches Alice’s attention. “Curiouser and curiouser…” Alice follows White Rabbit down a rabbit hole and tumbles down a long way passed many locked doors of varying sizes. When Alice lands, she finds herself to big to fit through a tiny door. Yet, she glimpses a lovely garden. As Alice sees a bottle labeled “DRINK ME,” she does just that. Thus, a whimsical, nonsensical adventure begins for Alice. What I Disliked: I believe I have to be in the mood for “nonsense” to read and/or listen to it. As a child, I found all of this rather silly. Let’s just say I preferred less fantastical stuff.